This methodology addresses teachers in secondary and primary schools or animators. This methodology explains how to engage students through a stimulating pedagogical methodology, specifically how secondary school students (aged 15 and over) can teach basic coding and STEAM education to their younger peers, pupils aged 8-12 years. During the CODINC project, we train the students and their teachers in the basics of coding. Our trainers will provide 10 hours of coding education in the classroom. After, the training, the secondary school students will coach pupils in primary schools accompanied by their teachers and our trainers. For the teachers in secondary school, conducting this project will help them in raising their science capital, develop a pedagogical attitude and coaching skills and to transmit the skills of basic coding to the pupils aged from 8 till 12. The CODINC project focuses on promoting inclusion through a peer to peer STEAM and coding educational training program. The students and pupils targeted in the CODINC project are specifically from neighbourhoods where there may be more exclusion, this is primarily measured through measured disadvantaged in comparison to other areas. Many country offer an index identifying schools or areas with higher levels of exclusion and disadvantages. The CODINC project helps raise the confidence of students aged 15-18 from disadvantaged backgrounds by showing helping them discover their creative, innovative and supportive potential. In practice this is done by training the students in a programme where they learn how to programme, create their own coding and STEAM education projects, and then go to teach students. This helps students who may be struggling with identity and are looking to find a place in an adult world. Students of disadvantaged backgrounds may have the feeling to be considered as outsiders, with the trust and confidence from adults to discover their creative and innovative potential. 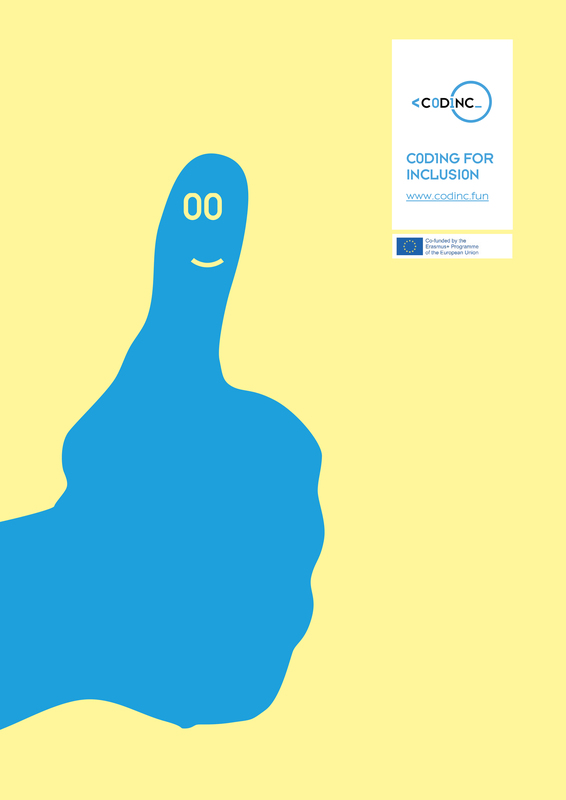 CODINC will adapt, disseminate and scale up the inclusive learning practice “Capital Digital”, which was developed and implemented by the project partner Maks vzw in neighbourhoods in Brussels, Belgium that are classified as highly disadvantaged. Capital Digital is a program that employs an innovative peer-to-peer learning methodology by training young people from disadvantaged backgrounds in STEAM and coding to become animators to their younger peers. In practice Capital Digital successfully trained 15-18-year-old students from disadvantaged backgrounds to teach coding and programming to their younger 10-12-year-old peers. The young “animators” learned to engage pupils in STEAM and coding activities in a playful way. This program became the first work experience for the young animators which enhanced their confidence, which in turn broadened their horizons when deciding on a fitting educational and career path. The program allowed them to connect with each other in a constructive way and to enjoy the role of educating their younger peers. Moreover, the project effectively supported young people by developing their critical thinking, creativity, digital and collaborative skills, and science capital. Most importantly, the Capital Digital peer-learning pedagogical method has a strong inclusive potential and fosters the STEAM education and the inclusion of disadvantaged students both inside and outside the classroom. The CODINC project adapts and transfers the Capital Digital methodology (and training toolkit) into a different educational context (schools - formal Education) and pilot it in 5 European countries, namely Belgium, Cyprus, Germany, Italy and Spain. There is a need across Europe to develop the digital competences of all citizens, in many countries the educational system is still not fully adapted to the use of ever-new technologies. In neighbourhoods where there are higher rates of exclusion, there is even more of a need to use digital tools to promote inclusive practices While pupils and students are active internet and mobile device users, teachers are needing to develop their skills to adequately support students in new technologies and competences. STEAM technology and coding offer new pathways for teaching, based on the interest of kids and students, enabling them to be producers, and not just consumers, of digital content. Primary school pupils (8 to 12 years of age) and secondary school students (15 to 18 years of age) from disadvantaged areas. We name the first group pupils and the second group students. Key stakeholders: schools, families, civil society organisations, local communities, NGOs, educational institutions and learning providers, public authorities, policy makers, etc. In this methodology, we describe a training schedule for the implementation for a 10-hour training course of coding and pedagogical skills for the students and a training schedule for the students and teachers. There are many similarities between the program proposed to the students and the pupils. This is done so, because the students should be trained on the same modules they will use in turn to teach the pupils. The training program for students and teachers focuses also on pedagogical methodology of coding, evaluation techniques and energizers. Through training the students easy to grasp concepts, their self-confidence to teach and believe in their abilities along with their self-esteem will grow and the fear that they have to coach something they don’t really understand will disappear.